With the river out of sorts and Sam eager for a fishing session I did offer the ‘joys’ sat at a mud puddle to catch some ten a penny lipless mud sifters but no, he asked. Couldn’t have Zed it better…. Now luckily for us there is plenty to go at in the locality and as someone who fishes for them exclusively in the closed season I’m a dab hand at catching them too. And some bigger ones have graced my net 7, 8 and 9 lbers. My standard method I leapfrogging areas of cover with two rods till the fish are found. In the winter they tend to be laid up and then that’s when the bigger fish usually reveal themselves and in the summer and autumn months they move around in packs and pockets where multiple captures and runs can be achieved. The float set-up goes like this from top to bottom, float stop, white bead, small inline pike float (Drennan Zeppler being my favourite) drilled bullet, quick change bead, 18lb fluorocarbon and then a offset Sakuma Manta size 1. It’s been perfected over many a trip, by fishing over-depth the float sits angled or dead flat on the surface and any interest on the Roach deadbait is easy to see. When the fish picks up the bait the runs are brilliant to see, they can go from left to right in stages, can go from static to quick in a split second and then in an entirely random fashion. But staring at floats ain’t for little Sam at the minute, he needs to be a little more active. So I was behind the floats he had a lure rod equipped with a Berkley Havoc white worm to work the margins. After an hour or so without much happening in a couple of usual hotspots Sam had a little Zander drop off the lure. But then the left hand float goes off and he’s witnessed his first Zander run…. It was only a small schoolie which is the norm but it had engulfed the bait so well it was acting like a gobstopper. Hook removed, baits back out, nothing doing. So with time against is it was on to the last swim. One bait tight to the lock overflow, the other in the middle of the channel, the lure working the edge. Within minutes the roach deadbait tight to the brick was on the move but this time Sam wanted to strike and play the fish on the bigger rod. And a good job of it, he did too. A passer-by expecting him to be playing a small Perch not a 2lb Zander. He went away happy, I well, I'm hoping he will become a fellow Zed head. Back in 2005 Richard Lacy a bridgekeeper at ‘Sellers Bridge on the Gloucester and Sharpness Canal spurred cryptozoological interest and raised the un-manicured eyebrows of the member of the Centre for Fortean Zoology to conduct a field trip of Lilliput proportions to try and find…. A crocodile monitor from the CFR (yes you heard), Andy Stephens, who followed up the sighting, said: "The ecosystem supports more than adequate numbers of food species to keep a single crocodilian, or indeed a small colony, well fed, as long as they could survive the rigours of the English winter." Possible warmer water influxes into the canal are being investigated. The conclusion from the CFR was that no crocodilian could, in all likelihood, thrive in a UK climate without there being a source of heat to maintain its body temperature throughout the winter months. However what do the culverts drain, could they be the source of any flow into the river during winter, which might raise water temperature? The ecosystem supports more than adequate numbers of food species to keep a single crocodilian, or indeed a small colony, well fed. Clearly the terrapins manage, demonstrably, they have been here for a number of years. The Gloucester and Sharpness Canal is a 15 1/2 mile long canal starting a mile north of the city of Gloucester and running south and west until it terminates at Sharpness docks, on the banks of the river Severn, some 1 3/4 miles north of the nuclear power station at Berkeley. Some other unusual sightings on the national species database. Osprey, seals, dolphins, porpoises and who could forget the Chinese mitten crabs, not just crocs. Now for the intriguing bit…. The Canal is on average 100 feet wide, 14 feet deep in the middle, tapering to 3 or 4 feet in the margins, and it contains some very bigger Zander hence why as a double figure canal Zed chaser it's appeared on my radar. Hmmm, I know a stretch of the Warwickshire Avon like that, and it is largely untapped, well with big baits and me anyway. For a big fish that didn’t want the neighbours to see it naked when it swam from the bathroom to the bedroom, it is an ideal place for sanctuary seeking. In-fact it would be that dark down there a big Zander, Carp or even a Barbel could run around stark bollock naked without even a twitch from the curtains, a peak between a gap in the blinds. So for this morning session in the gin clear waters of the Warwickshire Avon it was out with two deadbaits rods. With the deeper out most of the section was between 9 and 12 ft but a couple of swims were notably deeper at 14ft. Now the Avon is low at the minute, very low to 14ft would easily be 15 or 16 or even more when levels are up to winter levels. I cast both rods to some far side cover and the left hand rod within minutes goes off and the bobbin is jumping and the bait runner is going off. I've found that with Zander I've never really had an issues with drop takes because of resistance, they give the bait a proper doing over most of the time. So the fish is on, and it's keeping low, it's going to my left and putting quite a considerable bend in the rod. It's a powerful fish and is trying to get in to some marginal snags. I've applied more pressure now and managed to turn the fish. I can now see it in the clear water. Good be a PB beater, it certainly looks like it. I never felt fully happy with the fight though, and sure enough if you've caught enough Zander like I have they are tricky customers. Yeap, the first tail walk and shake of it's head, the fish is off and it goes back to it's lair. There must have been quite a few Zander now in the swim. A run on the drop, two missed takes eventually I manged to bank a 4lber. A couple more runs from small fish probably and then a Jack caught it was time to pack up. Encouraging signs for the winter, oh yes !!!! I had to get my head down at work prior to this holiday, you see a cup holder had to be designed quick sharpish for a buck property for a client I am providing studio engineering support for. From the sketch from the mind of a madman, in to CAD in two days. It was a relatively complex design to, with articulating flaps, rotary dampers and buttons. I'd not designed one for ages so was quite nice getting ones head down. Not a bad effort either, me thinks, ok the modelling wasn't parametric but hey, needs must, just needed to get a CAD model out quick for quote. Good thing is the design is divorced from the part it has to ultimately assembly to. So if if it didn't work straight off once the rapid prototypes had arrived and it was assembled there was some fettling time to get it to work properly, if there were still problems then it wouldn't be shown, end of. So headphones on, head down, Mixcloud and the Wifi battered. The weather looked like it couldn’t be more different for this family trip down to North Devon, you see August last year we ventured down to Tamarisk Esturary View and it was a week of shorts donned, sun cream and cold beer. The outlook you see was meant to be very mixed bag indeed, a big storm was rolling in on the Saturday because of a low pressure system from the Atlantic and rain, well lots if it apparently…. Waves, swells and wakes, well, they would be as big as houses…. So less sand would be likely be less trodden but with some nice scenic walking planned at the Tarr Steps clapper bridge and the River Barle in Exmoor and to Heddons’s Mouth I was looking forward to this trip. But then as Danny put it, Michael Fish Syndrome seems to taint many intended trips out, you see with Metcheck, BBC weather, the Met Office and Accuweather, all seems to have different levels of inaccurate weather, nothing really can be planned properly these days. Just got to pack for most eventualities such the uselessness of the meteorologists…. Forecasters warn of flooding to homes, power cuts and delays to road, rail, air and ferry transport, Intense low pressure system will bring a swathe of strong winds over southern areas on Saturday with wave swells approaching 35ft that could strike the South West coast of England at 9am on Saturday. Bunch of tarts these media lot are, then again anything to sell papers or to get the websites hits up to increase the advertising revenue…. For this holiday, obviously I brought a rod, (stupid question). You see last time on the last day of the holiday before I snapped my lure rod, I caught a bass on a popping frog and I loved the method so much, I decided to properly gear up for it. So it was out with the Savage Gear lure rod, and proper popping lure I’d bought, got to spend my money on something haven’t I.
I’d hopefully cram a few short sessions in, I couldn’t be closer to the water, well when the tide was high anyway. I was avidly looking at the tide times when we arrived…. Ok it was windy, very windy in fact, but storm Brian disappeared as soon as it arrived. The problem was for a few days the water was very coloured indeed, so maybe bait would have been the better option. But me and Sam stuck to the task in hand and went about trying to winkle out a bass. I used the pop queen on the most past which is 105mm and 28 grams, it's a kind of bullet shape which made it a cracking casting lure. The slow erratic retrieve creates plenty of surface disturbance whilst a faster retrieve will make it dive just below the surface. When allowed to rest the pop queen sits its tale down and when given a sharp pull the cupped face will 'pop' when it dives in to the water. Cast after cast, for a few mornings, nothing was doing at all, the bass were either not that, or not feeding. It was still coloured with visibility poor throughout the week. Sam got bored, "Dad are we ACTUALLY going to catch anything"
"That's fishing for you Son"
"Fancy a carp lake the weekend"
"No Dad, can we go to the river"
A pub crawl in Appledore with my brother with two of the pubs having an open Mike night, it finished off a cracking week, lots of sea air, good food and a belly busting copious amount of the local beer. The fishing well, all a bit Mehhhhhhh !!! Talk about a Hollywood cover up and a massive fall from grace from the ex Miramax front man and co-founder of the now disgraced Weinstein Company…. You just wonder why it took so long to all come out, and boy it’s all come out now hasn’t it. With a face only a mother could love, maybe the years of female rejection as a teenager and young adult turned him in the predatory creature he turned in to. He’s everywhere at the minute, print, press and social media, cannot get away from him…. I just learnt to deal with it…. However, post stinking bishop and a couple or three glasses of Nero D’ Avola, things can go off the scale, copious amounts of tryptophan you see, doesn’t agree with me. One of my rare properly in to dark fishing sessions, bankside, light fading, bats out. Night-lites, snapped, a soft green glow. Sit back, tips static, waiting for that Barbel or Zander to pick up ones bait. Motionless minutes turn in to what seems like hours. Every small sound, turns a mouse in to a monster. Hmmmm, I’m not enjoying this. 2 hours in without a bite, my subconscious mind, overly active. Time to pack up, head torch on, feel better now, rods out the water, leads removed, rod tip protectors donned. Last scan of the water with the Nitecore’s 2000 lumens, fish jumping, thousands on the surface. Scans the water again, it’s getting closer, it’s a boat, wtf !!!! Nothing in the boat but it’s moving against the flow, something’s not right. It’s 20 yards from me now, then all of a sudden, a massive surface disturbance, the boats moved, I’m scared now. Heart in mouth, a balloon faced man’s head emerges from beneath the water and then stares right at me, for a couple of seconds, ‘it’s face’ now fully illuminated. It's Weinstein, it's Weinstein !!!! Then time stands still, its head now disappears from view, then the air changes, a drop in pressure, the sky appears even darker. This thing has now exited from the water again, massive tentacles for arms propping itself on the boat, this time it’s fat face seems even bigger. A clear face of rage, body of grotesque proportions, my heart now pounding, scared as hell. Its silhouette masking any residual light, it’s now proper dark, the head torch, on and off this giant figure, I feel it’s getting closer. Back to the sanctuary of the Wife’s cosseting bosom. I get back to sleep pretty quickly. So for this session in to dark down the Warwickshire Avon it was out of the fireplace in to the fire. When I got there I couldn't believe how clear it was, so fishing in to dark definitely the way to go for a short session. I don't know this stretch very well at all, I need to maybe get the deeper out and have a search around but I settled in the first swim and got the rods baited and in to the water. I like using big baits for Barbel and this was no exception, but as it was the Lower Severn set-up I only had that option. So out with the 28mm boilies, oh yes !!!! I use a long hair too, to try and avoid all but the biggest gluttonous Chub. The 2nd rod was a standard Zander set-up with a headless roach. With dusk approaching, and both rods in I could sit and watch the night-lites getting brighter and brighter. Both rods were on Gardner TLB's too, as I'm not one to watch tips constantly, not only do I find it hard to concentrate but I'm also distracted by those 'noises' that appear around you when in this sort of environment. Anyway not much happened for an hour, but then about 45 minutes past dusk the right hand rod goes from stationary to mental in a split second. 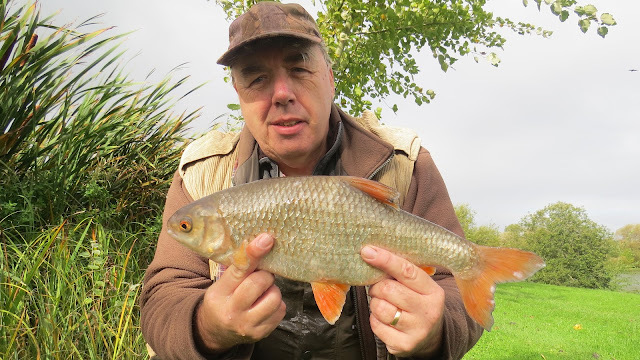 I was convinced it was a Barbel at first but the distinctive fight from a Chub that they give, there was not denying what it was. Quite a big frame to it, very long indeed but obviously been on the Atkins diet as it only went 3lb and 14oz's. Encouraging signs mind you and I'm glad I'm got a fishing in to dark option on the Warwickshire Avon as it means I can get more sessions in. Zander particularly, which are not known to frequent this area. I'm sure there are some milling around though and I want to catch one. Rods back out, half an hour more, motionless, so with the rain coming down I finished the session early. Have a look behind your sofa, you see apparently half a billion old £1 coins remain in pockets, and piggy banks even though cease to be legal tender today. Boris Becker would love them to sort out his £54,000,000 ‘overdraft’ or maybe gather them up and send them to Brussels HQ with a note saying…. Nationwide will take them until December 20 where they will take them for the kids Make-A-Wish Foundation, yeap that’s a better idea me thinks. Now talking about making a wish…. You see the Avon is a little out of sorts at the minute, low, lifeless and back to clear again and I’m twiddling my thumbs wondering what to fish for. I could bag a Barbel at dusk, fish the weirs for predators or trot some maggots for the smaller stuff but without Sam for this session I fancied seeing what was up at the deep bit. Now a friend Dave texted me recently asking where all the Zander were, as we have had some success in the past in a few areas that seem devoid of them now. The thing is they are unlikely to be moving that much at the minute. Why, well it’s clear, very clear so even deep swims will be like the curtains open for the Zander, the have unbelievable eyesight after all. As soon as there is some colour in the water then that’s when thing change…. With the net curtains now up they can hunt in packs and surprise even the most wary of fish. Also apart from being clear, it’s still very mild indeed. I’ve found with canal fish, you can catch schoolie after schoolie on deadbait but as soon as the frosts come the water gets cold that’s when the bigger fish start turning up. I’ve caught them on the lure with a little colour in the water but for this session it was Pike I was after, there are plenty here, the Zander I know where suspicious in their absence. Dawn, overcast and after about 30 casts I’d already had a few follows from Jack Pike but as the morning went on it they were clearly not having it. Dan was up here too fishing deads, and despite giving me one of his guaranteed Zander banking soft baits, nothing much doing. Eventually after swapping to a shallow diver I fished some swims with some vegetation in the margins I eventually picked up a tiny Pike, probably the smallest I’d ever caught. At least it was a pretty fish, a blank avoided…. I’ve not experienced the Coventry ring road in anger for some time now but having to venture over to the ‘delights’ of the Foleshill Road the other day to meet up with some friends for some catch-up fodder I was looking forward to a nice pint of ale. You see apart from the unpleasant but controlled chaos this road brings, the lovely council have also turned in to a building site with major road works going on. Probably to something to do with the student accommodation that is seemingly taking over the City over recent years. So the concrete jungle looked even more concrete. But I’ve a soft spot for Coventry as it formed a big part of my social and work life, and given the choice to live in Cov or Brum, it would be Cov no question. People get on in the most part. Oddly not being over for sometime the demographic of this road has changed in a short period of time, at least I know where do come for a cheap car wash. Anyway with more luck than judgement I managed to arrive in one piece, a thirst quencher required. A throwback from the 1970’s the huge TV’s a distraction from looking at the carpet. Luckily the food was pretty good, massive sizzling platter of sheek kababs, lamb chops, and tandoori chicken were polished off and the balti’s tasty. Spicier than the usual curry house norm too, no complaints from me. The cheese, garlic and chilli naan’s particularly good. No short measures here. About 3.00am I was rudely awoken by a farting fox and oddly seemed to coincide with a bout of heartburn that I experience from time to time. So after a load of Gaviscon’s finest I couldn’t get back to sleep, so only one thing for it, I’ll make the rods up. 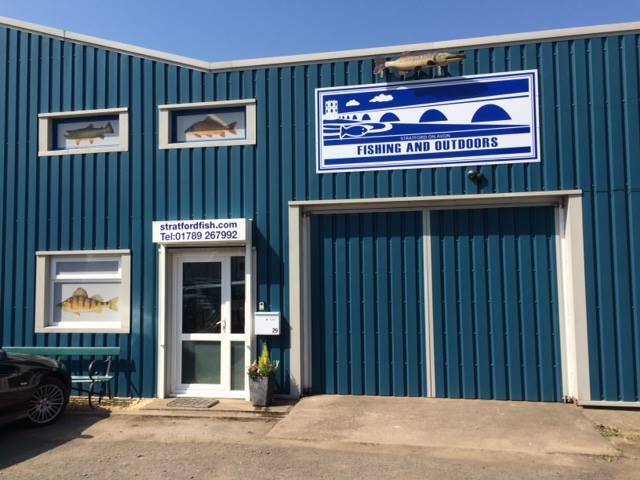 You see I’m off to the Lower Severn for a fishing weekend and as a big planner of my fishing trips might as well make hay whilst the Wife sleeps. Targets for the Severn trip, well having caught a Rudd there last time, a trotting set-up but the main line of attack would be for big Zander, big Barbel and Eels. Two main rods, both running set-ups, big Boilie, Roach deadbait. So with the rods already made up, might as well give them a bash up a deep area of the Warwickshire Avon. There is an area of Cabbages where I’d caught Zander from before so this short morning session with Sam, a dead and a big boilie were positioned whilst Sam had his quiver rod with last week’s maggots to use up. So best laid plans and all that, meticulous planning, never paid off. The conditions are not brilliant at the minute and with a boat equipped with an outboard powering up and down the stretch the wake probably put the fish off. No bites on maggots either such the dire session. Wind picked up, Sam got cold, you get the picture. I ended the session early, just nothing doing. I've not managed any beasts from this stretch of the Warwickshire Avon yet, but it's an area where Barbel are in numbers, so for quick session like this after work one, it's ideal. 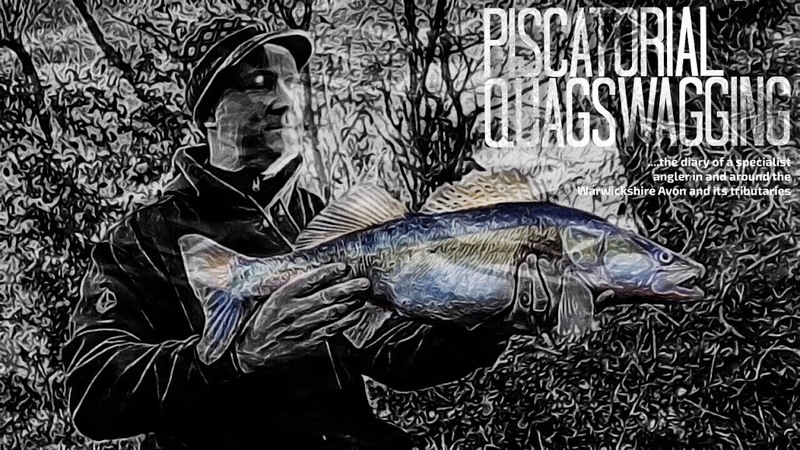 An angler in a very productive peg was biteless despite moving swims prior and a couple more maggot danglers downstream were not fairing any better it seemed. The river a little out of sorts to be honest, clear again, dropped like a stone and the fishing ain't easy, especially at a reasonably pressured area. But, as soon as the light goes headed in to dusk, things change, so with the rod made up, (glugged wafter and a pva of freebies) it was positioned in-between some streamer weed. So with all but me bankside, after 10 minutes of this short hour and a half session the first indication, a tentative chub pull. 15 minutes till official dusk (well app on phone) another couple of pulls, but this time a Barbel me-thinks. Sure enough, another 5 minutes all hell breaks loose, the centrepins ratchet is screaming an a Barbel is on. I'm still amazed at the fight they give, rod bend double, tip nearly touching the water, after a couple of premature attempted netting's the fish was eventually in the net, a proper scrap. Rested in the net to recover and a quick pic the fish went 8lb 8oz for a few more bloggers points. Now with a Lower Severn trip on the horizon and rods to be made up, next week I'm having a rig reccy at an area I can fish properly in to dark. Big Barbel bait this time though and the other rod will have a deadbait. Next year I might even give Barbel a proper go to try and bank some bigger fish that I know reside in certain areas, a species that has my utmost respect. As an occasional pork pie consumer, sausage roll muncher, and savoury pie eater I’m not usually a fan of cakes and things sweet, but whack a Victoria Sponge in front of one’s eyes the visual treat is so overpowering my waist line maintaining willpower goes out the window and I’m looking for the cake knife to cut myself a sizeable wedge. The combination of raspberry jam, the light golden sponge and copious amount of butter cream, oh the butter cream, I just cannot resist I really can’t. Maybe I have a sweet tooth after all, as I like Baklava with its filo layered honey, nuts and syrup concoction, and Tiramisu with its coffee flavoured ladyfingers, mascarpone cheese, custard and booze. Everything in moderation, as there is nothing wrong with a nibble on something bad now and then. Not a lot of dosh is required to make either of them, heck even The Wife can make them, yes really. So for this morning session Sam was joining me for a predator session, there are a couple of swims here that are full of them, which is odd really as it's one that is frequently poached by the unwashed and book decliners. I'm not a frequent Pike fisherman but I'be found as it's still mild a live bait would out fish a deadbait, something visual rather than something on a plate so better get some. The plan was to catch a few baits by Sam on his maggot rod, store them in an aerator and use them under a small pike float as and when required, and then the luckily remaining would be returned once it was end time. A worm didn’t tempt anything of significance before, maybe a visual treat would get a Big Billy’s head turning. Out with the Victoria Sponge, with that extra thick layer of butter cream. As we were catching a few baits a larger fish took the maggot rather than the bleak humdrum and upon retrieval a pike came up and grabbed it. The water is gin clear again and the whole drama was a nice visual treat. With some baits caught ( I had to put the gudgeon back as they are special fish, Dad) someone was already sat in the weir so we try a couple of swims without success so it was onwards to the weir. Sure enough with Sam manning the rod, a bleak was taken within seconds and a Pike was on. "Dad, I've got a shark on, a SHARK, a SHARK !!!" With the shark Pike landed (6lb or so) with Sam doing all but the netting, I showed him the way to handle them and the fact they need care when unhooking. You want to return it safely to catch it when it's bigger after all. An enjoyable session and were left before the King of the Tangles got in to his full stride. I had planned a Barbel session Sunday morning but sinuses about to exploded and my temperature, up and down like fishing sessions. A little like my post count which has now reached 500 !!! I haven't had a good week, butter fingers you see, well not just butter fingers, outright stupidity. I’m not talking Ben Stokes levels of stupidity, but unusual behaviour for me. You see, I broke the top section of the fishing rod I’d just got repaired AGAIN without even using it, broke some crockery in a holiday let we were staying in, had a candle wax accident that ruined my favourite t-shirt and then to top it off, me and Sam were playing football IN THE HOUSE !!! with a soft ball and somehow managed to knock an ornament off the mantel that was a wedding present from my sister which proceeded to take out a couple of tiles off of the hearth. I’d don’t usually do sitting it out but it was necessary for this session. The area of can really throw up some surprises, it can throw up the unexpected. So many different species seem to like here so when a bite is received, there is added intrigue to what will eventually surface. Now carp are known to frequent its margins and that’s what I was here, you see with my mediocrity in the bloggers challenge I needed to start crossing off the species I’ve yet to catch. I’m on 10 crossed at the minute with maybe 6 or 7 further species that can be caught on flowing water that I need to get stuck in to. Once I’ve made more of a species dent, then as the fish get fatter in winter that’s when I can properly target specific species to try an increase the weight of each and every one and boost the points tally. I don’t do lakes that often, canals yes but generally only in the closed season and as someone who balances his work, fatherly duties and available fishing time very carefully trying to climb up the river leader board is about my only option. There has been a nice nip in the air this week, so my attention from time to time will switch to the predators that swim within these Bard’s waters. So yeap, a bit of double dipping for this quick afterwork session. A bolt rig equipped margin rod with a big bait over some freebies and then a dead out in an area of cover where things with teeth will likely be laying up. The session was a pretty non event to be fair, a couple of small Zander and a 6lb 8oz Pike. Dave a friend who was elsewhere faired a little better and also had a surprise hook up with a species that you wouldn't expect where it was hooked, he lost it mind you, but very interesting indeed. Back out in the morning with the King of the Tangles. 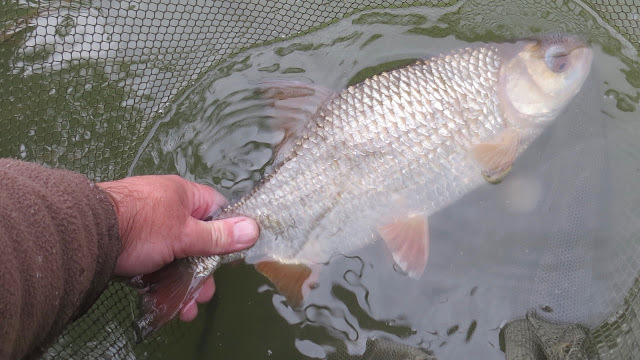 So looks like the bloggers challenge is hotting up, whilst I was on a weekend away watching the annual Brockweir soapbox derby James was sharing some pictures of something monstrous he caught down the river, then Martin phones me to share a capture of this clonking 2lb 13oz Roach. The weather held for the soapbox derby, the local ales were lovely as were the food stalls. The Roach deserved a thread of it's own rather than hidden in his wall, a cracker. Now as someone who struggles to get bankside as much as I’d like, got to up my game and get some decent river species banked. Autumn and in to Winter my favourite time though, so plans are in places to get bagging some points again.